I have an Akai AP-A200 turntable with a speed problem. When is working the speed is uncontrolled, like full speed of the motor, no 33 1/3 or 45 rpm. The motor it is a direct drive one. I believe it's a problem with the speed sensor, but I don't know how this works in this kind of motors. Does anyone knows this problem and a possible solution? How does work the speed control on these motors? I think it works more or less the same way with akai. I don't have a schematic but I can upload a photo of the motor. I have checked all the capacitors and transistors and I didn't find any faulty. If you have any idea what can be the problem, I really appreciate your help. The previous "guest" post is mine, somehow my login was offline. It is certainly very similar to a standard capstan type motor. Looking at the pictures, it is rather difficult to say where the FG may be? Wonder what the adjustment pot is for? 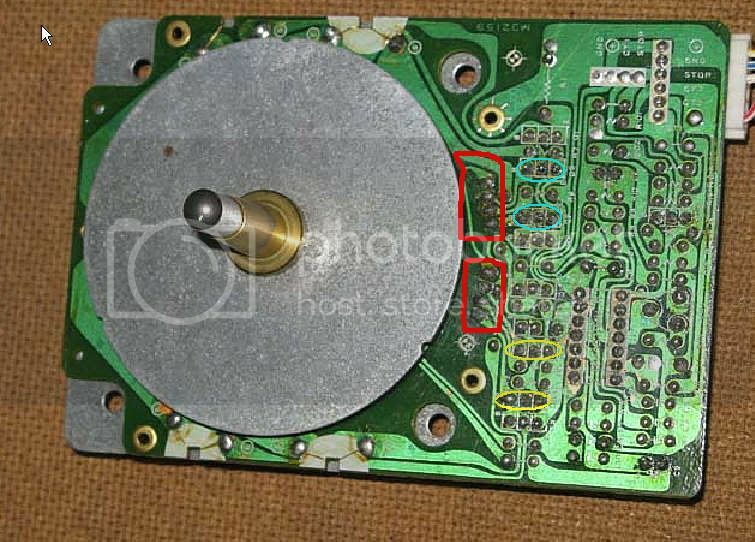 It is possible that the entire process is done within the motor OR the FG coil that I talked about earlier, be on a separate tiny pcb located at the edge of the spinning platter? Is there anything like that? What is the number on that drive IC...1031? How about the number on the motor that seemed to 've been whited out? I did find schematics for some other models but each one is different. Judging by the number of wires coming of the motor, the FG is either done within the motor OR is done separately. In this photo behind the metal are 4 coils, FG? I notice on the other side of the board (other photo), behind the big wheel are marks on the board around the edge of the wheel. These will work to control rotational speed? I think entire process is done in the motor, the 4 wires goes from the motor to a small PCB where is the button to change speed. The number on the IC is VC1031. The number on the motor is SS09DA 130073. On the other photo you can see 2 groups of 4 solder points near the edge of the wheel. 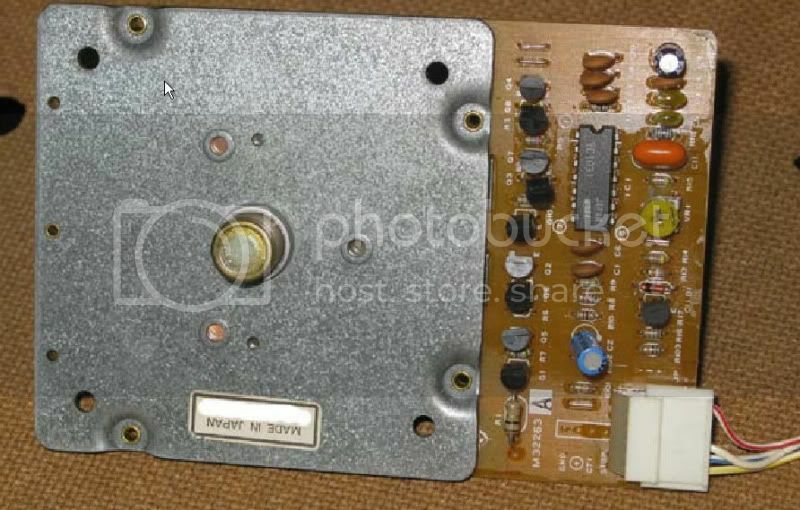 These do the connection to 2 (transistors??) located behind the metal (this photo). I have a suspicious on these but they are hard to see and remove. I have checked them with a multimeter but I'm not sure what are the correct measures to get from. I believe the adjustment pot is for "small" correction of the speed, but at this moment doesn't do anything and I think it's working ok. I didn't find schematics but if you have one or more that you may think useful please tell me how to get it. Looks like it. Tried looking for VC1031 Datasheet. Apparently it is an ancient, non-existent NEC driver. the FG coil here looks more like some sort of a sensor? ( something like a hall effect or some sort of an interuptor?) Looks like someone has been all over that area big time? All the transistors/ connections ok?. If you look with a scope, as the motor turns, you should see some sort of an activity like a pulse, sine wave etc coming off the sensor(s). If you spend the time, you could probably draw an approximate schematic. Notice that each section's output goes thru some sort of amplification &/or buffering before ending in the IC. I would not be surprised if the trouble is with the sensors. Chances of finding something like that is next to impossible though. As far as the schematic, I do not have anything close. I do not know this guy but he seems to have a good bit of Akai stuff. May want to email him? Yes, I believe the speed is controlled by some magnetic wave or something like that. The connections are ok, I tried many looking for cold ones with no result. Those you marked with a red line are the ones I have a suspicious that are the problem. They are under the metal on the other photo, and I can't see what they are and the reference number. 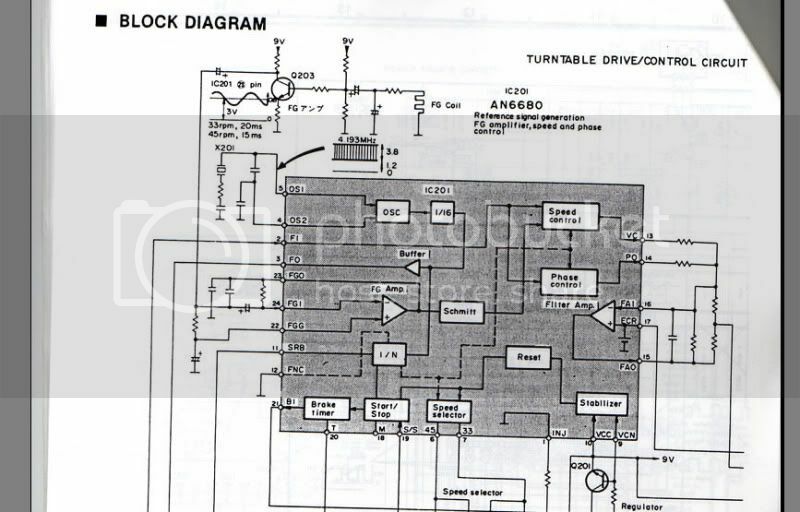 For that I need a schematic. I don't have a scope, but I think I can have access to one. But without the schematic is not easy to know how is the right pulse, sine wave, etc, anyway it's possibly to see if exists. Those areas marked with the red line, I believe they control the speed (one for 45rpm and the other for 33rpm). But the turntable is not doing any of those speeds, so both must be faulty? It's not impossible, but... the problem may be on other part. I sent a mail to the other guy and I'm waiting the answer. On his site it's a reference to this turntable and the other components of the hi-fi system. When I have some news I will post it here. Hi .Better late than never. 4 legs element is Hall sensor.Sometimes bad.Akai has 2. Driver VC1031 almost impossible to get.